BOSS continues its top-selling tradition of portable, affordable multi-trackers with the new BR-800; a battery-powered studio to go. The sleek new design is made possible by touch-sensor switches and SD-card recording media. Up to four tracks can be recorded simultaneously with eight tracks of simultaneous playback, plus an additional stereo track dedicated to the built-in rhythm generator. The BR-800's powerful onboard effects processor includes GT-10/10B effects, VE-20 vocal effects and harmonies and COSM-based, acoustic-guitar body modeling. EZ Recording feature interactively guides you through the recording process. A stereo microphone is also built into the BR-800 for instant Song Sketch recording. No matter where you roam, you'll never miss a moment of musical inspiration with the BR-800. Whether you're creating intricate, multi-layered songs or point-and-capture field recordings, the BR-800 makes the recording process fast and easy. Beginners will love the new EZ Recording mode that interactively guides you through the recording process. Other helpful features include the convenient Retry function, which recues automatically to fix mistakes and Song Sketch recording for instant, one-touch capture. There's also a built-in stereo condenser microphone plus a DR-880-quality rhythm generator for adding drum and percussion tracks to your songs. 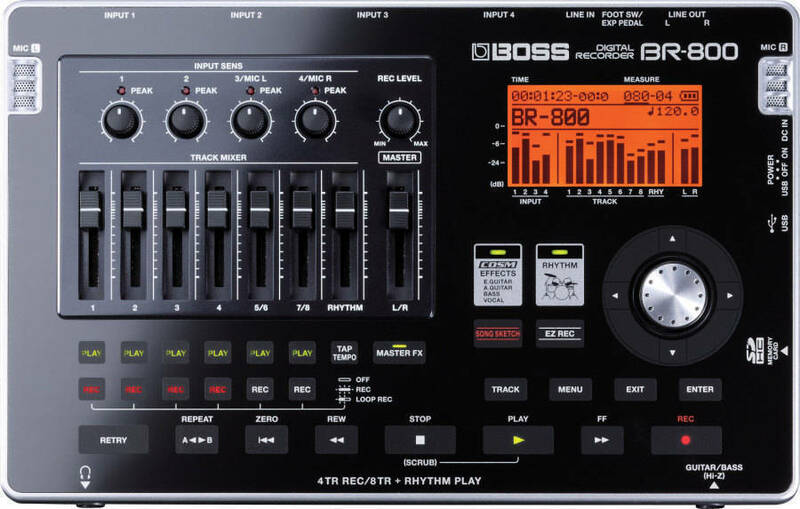 Enhance your recordings with the powerful BOSS effects onboard the BR-800. Many of the effects are derived from BOSS's flagship processors, including vocal effects from the VE-20, COSM guitar/bass amps and effects from the GT-10 series, modeled acoustic-guitar body effects from the AP-1 preamp, which imparts pro-quality miked-up sound and rich body tone to line-recorded acoustic guitar. You'll be amazed at how much processing power is built into this little recorder and how excellent the effects sound. You can power the BR-800 from the included AC adaptor or, for ultimate mobility, it can be powered from six AA batteries. Record anywhere! Stereo microphones are also built into the BR-800 for instant Song Sketch recordings great for capturing song ideas (acoustic guitar and vocals, for example) from any location. AD Conversion: 24 bit /24-bit + AF method (GUITAR/BASS input)*AF (Adaptive Focus) method is a proprietary method from Roland that vastly improves the signal-to-noise (S/N) ratio of the A/D and D/A converters. • The above-listed recording times are approximate. Times may be slightly shorter depending on the number of songs that were created. • The above number is the total for all the tracks that are used. If each of the eight tracks contain an equal amount of data, the length of the resulting song will be approximately 1/8 of the above. • May vary according to usage conditions, phantom power used, batteries used and type of SD card used. Weight: 890 g / 2 lbs. I've had no problem with this at all. Very easy to use, good tones, good effects, takes keyboards and mics nicely, and perfect for experimenting with song creation. It has two condenser mics for stereo recording right on it. Display and navigation is easy. Recording and mastering can all be done right on the unit. You can also connect an expression pedal for real time pitch shifting and choose from a large selection of wahs. Don't forget to fully read the manual and update the firmware. Hook it up to your computer to be powered via USB and run your whole computer sound system through it. Remember, new features are available if update! I bought a BR-800 and found it awkward to work with. The no button control surface is flaky. The recording options are not so intuitive and it only has four inputs. I sold it and bought a Zoom R24 and it works a lot better. I bought my BR-800 about a year ago for $550.00, and it was worth every penny. The effects alone are worth the money, not to mention it works great with my Macbook and Logic. The built in microphones are great for picking up samples from anywhere since it runs off of batteries.